The Loro Piana Superyacht Regatta 2016 saw 18 prizes awarded to the winning superyachts, following a competitive four days of racing at Porto Cervo. 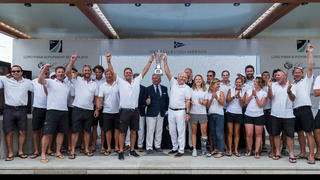 The YCCS Trophy, which is awarded to the overall top scored classified yacht owned by a YCCS member went to Open Season. The Loro Piana Superyacht Regatta 2016 saw 18 prizes awarded to the winning superyachts, following a competitive four days of racing at Porto Cervo. 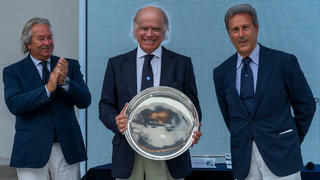 The YCCS Trophy, which is awarded to the overall top scored classified yacht owned by a YCCS member went to Open Season. 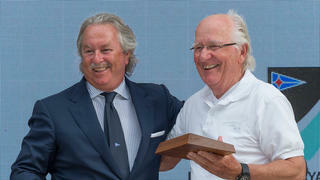 The IMA Trophy is a plaque offered by IMA for the overall top scored classified yacht that is an IMA Member. 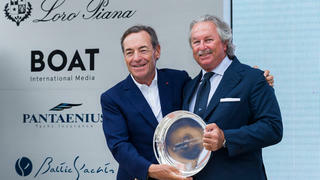 Mr Pier Luigi Loro Piana presented the plaque to the owner of Saudade. The winner of Wally Group 2 was Ryokan 2, whose owner was presented with a Wally Trophy at the Loro Piana Superyacht Regatta 2016 by Wally CEO and Founder Luca Bassani. 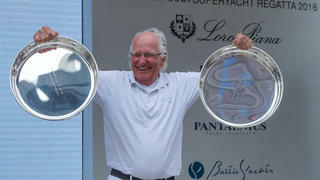 The Wally Group 80 trophy was presented to the owner of Lyra. 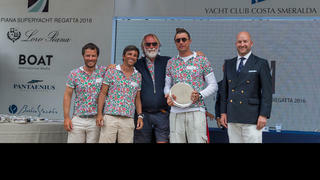 The winner of Wally Group 2 was Ryokan 2, whose owner was presented with a Wally Trophy at the Loro Piana Superyacht Regatta 2016 by Wally CEO and Founder Luca Bassani. 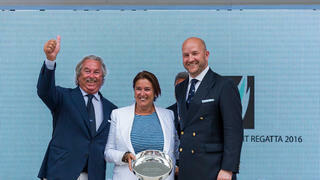 The Wally Group 80 trophy was presented to the owner of Lyra. The Gino Bossi Trophy was awarded to the Wally winner of the combined coastal races, which was Magic Carpet 3. The crew of Ohana collected the Loro Piana Trophy for third place in Sub-Class C at the Loro Piana Superyacht Regatta 2016. 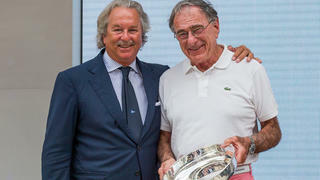 The Loro Piana Superyacht Regatta for third place in Class A was presented to the owner of Seawave. The owner of My Song was awarded with the Loro Piana Prize for third place in Class B. 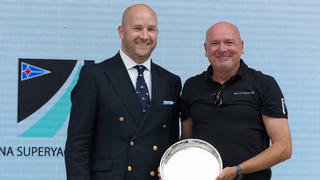 The owner of Lyra was also presented with the award for third place in the Wally Class. The owner of My Song was awarded with the Loro Piana Prize for third place in Class B. The owner of Lyra was also presented with the award for third place in the Wally Class. 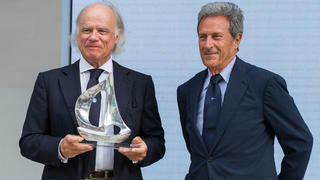 The Loro Piana Trophy for second place was presented to the owner of Unfurled by Mr Pier Luigi Loro Piana during the prize giving ceremony. 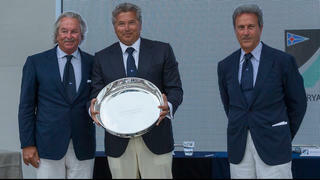 The winner of the Loro Piana Trophy for second place in Class A was collected by the owner of WinWin. Whisper won the Loro Piana Trophy for second place, which was presented to the charterer on Saturday evening during the ceremony. 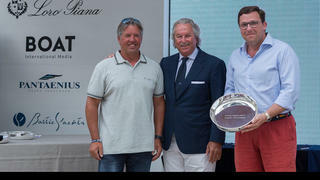 The owner of Magic Carpet 3 also scooped up the Loro Piana Trophy for second place in the Wally Class. 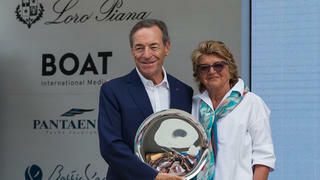 The owner of Saudade was presented with the Loro Piana Trophy for first place for winning both Sub-Class C and Class A at the Loro Piana Superyacht Regatta 2016. 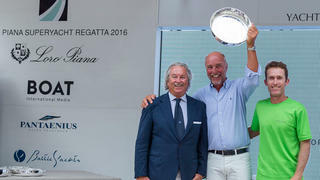 The winner of Class B, Grande Orazio, was presented with the Loro Piana Trophy for first place. 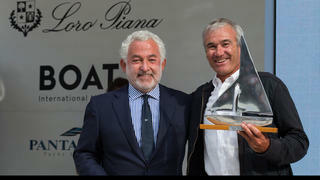 The Loro Piana Trophy for first place in the Wally Class was presented to the owner of Magic Carpet 3 by Commodore Riccardo Bonadeo. The Loro Piana Prize, The Silver Jubilee Cup by Boat International Media is awarded to one of the class winners over 100 feet with full cruising interior. This trophy was won by Saudade.